Staff Sergeant George Nickel is in court again today. Hopefully, this will be the last time. Hopefully, we’ll see him go somewhere where he can get the help he needs. He’s pleaded guilty to a felony, discharging a weapon into a building, in exchange for having all other charges dropped. He’s still looking at up to 15 years in prison. We want to see him put into secure care. Most of all, we want to see him get better. Very few have given as much as George and survived. He deserves better than we’ve given him. One of my friends was a Marine reservist. His brigade was on alert to deploy for the invasion. I remember him coming to the dorm with all of his gear and sorting it, packing each piece of equipment away. He didn’t go, then, but he went twice later. The second time, he got to Ramadi just days after I left. War came while I was on spring break from my freshman year of college. We were younger then, carefree and troublesome. Neither of us had much idea what war was like, but we were more than ready to defend the rightness of it all, and to go and fight ourselves. We could have looked around and seen what war can do to a man, but we didn’t. There was a grounds man there at college who was a veteran of Vietnam. One day, some students made a dry ice “bomb” by dropping chips of dry ice in a plastic soda bottle, adding water, and screwing on the cap. They dropped it out a window, and this man, this veteran, came around the corner and saw it lying there on the grass. He went to pick it up, like he did with all the rest of the student trash. Just before he got to it, the bottle exploded. He tucked and rolled, and ran behind cover, scanning the courtyard. Hilarious, right? I thought so. I wasn’t one of the guys involved, but I sure laughed about it when I heard. Like I said, we were younger then, and troublesome. We thought that flashbacks were something that ‘Nam vets had drugged themselves into, or made up so they’d have something to write on their cardboard signs. PTSD wasn’t really real, either- we all knew that that was largely an invented boogeyman. I knew all of this before I saw a bomb explode in earnest. UPDATE: SSG Nickel is out of jail and checked into the VA for resident treatment. He will be on strict felony probation, but if he fulfills all terms of probation he can actually get it removed from his record once it's over. This is about as good of a result as we could have hoped for. George has a chance to get his life back. That young woman wanted nothing else than the chance to explore her newfound freedom. She didn’t beg for help, or plead for her life. Voting would become her final act. In that moment, she matched our own sacrifices. Denfrund, Carlson, Sizemore. Iwan. Gonzales. Mock. Our friends died to secure this day. And here on this road in Diyala, I saw proof that the blood spilled in this backward country had value. It made the cause noble and just. This may not mean much to someone who stands in opposition to our fight, but it is the legacy of our fallen. The honor of their sacrifice. It's been three years now, and I can still taste the dirt, still feel the loss, and still remember watching my platoon slowly inching home. SSG Nickel almost died 3 years ago, too, and he's fighting his own battle back here at home now. We could use you to write letters and lend support. Go read Badger 6 for the background.
" So the issue for those of us interested in Staff Sergeant Nickel's treatment is this, can we get the prosecutor to be more flexible and can we push the VA to do more. I think the answer is yes. The public needs to let the relevant decision makers, all of who work for you, the taxpayer, know how you feel. Citizens of Idaho, and in particular Ada County, can let the prosecutor know that while you appreciate the concern for your security, you also appreciate what Staff Sergeant Nickel and his fellow Idaho Army Reservists did in Iraq. People from out of the area (and I am looking at many of my fellow Springsteen fans up and down the coasts) can let the prosecutors know this case has national attention. I of course recognize that my own knowledge of this situation is, like that of anyone else interested in this matter, inherently incomplete. I also appreciate that the psychological issues presented in this situation are complex. Finally, I fully understand the seriousness of the acts of Mr. Nickel on July 28, 2009, and do not mean in any way to minimize or trivialize them. However, based on my understanding of all of the background facts concerning Mr. Nickel’s case, as well as my personal confidence in the judgment of Mr. Coulson, I write to express my opinion that Mr. Nickel should not be criminally prosecuted in this case, and certainly not with the goal of securing a 15-year sentence for him, as I am informed your office intends to pursue. I think he puts this professionally and politely. That is what we need to be, polite and professional and urge compromise. What ever rules and regulations may be blocking some sort of resolution of this matter that benefit both the community and the American War Hero Staff Sergeant George Nickel can be waived or adjusted. They do not exist for the mere reason to exist; they should exist to help the Veteran. I urge you again to be polite and respectful in all correspondence. Additionally I would suggest writing to the Governor of Idaho. Staff Sergeant Nickel has many years of service to the State in the Department of Corrections. We need to be motivated and tell our public servants what serves the people of Idaho and the United States the best; balancing the security of our communities with the needs of our veterans. It could be any of us in that apartment, and for those of us that have seen our friends killed and wounded it could have been any of us in Staff Sergeant Nickels boots. If we flood them with letters we can influence the outcome. Please write now and pass this on. " I had one heck of a hectic semester of school this term. By the end of November, I was devoting a ton of time to keeping ahead in my classes- more than I have since I've been back to school after Iraq. I did well, though, and I only have one more tough semester ahead before I graduate. This term will be fairly easy- some light math, physics, and a little American history to keep my mind active (and fufill those wonderful core requirements). I've been blogging somewhat regularly about what I've been cooking. I know that's not why a lot of you come to this blog, but if you find that sort of thing interesting, mosey on over to acutecuisine.wordpress.com The most recent post is about kufta kebab, the roasted ground meat skewers that I grew to love in Iraq. It's possible that I'll deploy again before my term in the Army is up- if that happens, I'll move this blog completely over to Wordpress. I maintain archives there, but continue to update here. I've gotten to read a fair bit over winter break, which has been relaxing and wonderful. I finally finished off Ali Eteraz's Children of Dust. Frankly, it was hard for me to read some parts. Within the first 50 pages of the book, he'd been beaten at a madrassa, lost his baby brother (and had a relative accused of witchcraft for the same), and the neighbor's son had been caught (ahem) with a goat. Read it. It's a tender, dark and dryly funny account. I also go to read through two military histories: If Not Now, When?, an autobiography written by COngressional Medal of Honor winner COL Jack Jacobs (Ret. ), and The Bomber Boys, a history of B-17 bomber pilots in WWII. My grandfather was a co-pilot in the Army Air Corps (he retired as a Lieutenant Colonel in the Air Force). I still remember how proud he was of me for joining the Army. 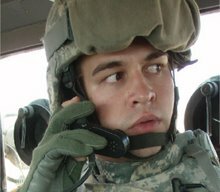 He died while I was in training to go to Iraq, and I regret now not asking to hear more about his experiences. Both books were excellent. I'll probably pass them along to my younger brother, who has recently become interested in military histories. You know... the IED fight in Iraq and Afghanistan will make an interesting history someday. The VA jumped in to try to right the problems faced by thousands of veterans who switched over to the "Post-911 GI Bill" who then experienced delays in getting their money. This is now called the VA GI Bill Emergency Payment process, and it pays out a $3000 advance to anyone enrolled in college with post-911 active duty service. Unfortunately, it sounds like it can be hard to get banks to take the emergency checks. I'm so glad I didn't switch over this year. In the time I save not having to worry about my GI Bill coming through, I read. I've got Children of Dust coming in the mail. Children is Ali Eteraz's autobiography, tracing his journey from Pakistan to America and back again. I'm looking forward to it- I got to meet Ali at the Blogworld Expo back in 2007, and I followed his blog at http://alieteraz.com/ until he shut it down. (There's still a collection of links to his articles there, though.) He's a sharp guy, and I'm looking forward to reading his book. George Nickel is still in jail. The Idaho Veteran's Network benefit is on the calender for 5pm on Saturday, Oct. 17th. If you're in the Boise area, swing by the Eastside Tavern at 610 E. Boise Av. for food and drink specials and a raffle with some sweet donated prizes. Monies raised will be put towards George's defense, as well as TBI awareness in Idaho. The Veterans Affairs Department blamed a backlog of claims filed for GI Bill education benefits that has left veterans who counted on the money for tuition and books scrambling to make ends meet. My benefits are fine. Of course, I filed well in advance of the beginning of the semester, and I chose to stick with my old Chapter 1607 for another year rather than switching to the new Post-911 GI Bill that was supposed to be so great but wasn't really all that great. I'm betting that's where the problem happened: there was a new GI Bill chapter on the books, and they weren't prepared to help the vets who wanted it. I'm even more glad I didn't switch over this year.